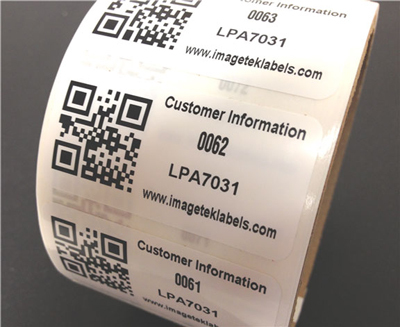 QR Code Scanning: Which Kind of Labels Are Ideal? Why QR Code Scanning for Asset Tracking, Attendance, and Security? QR codes are an excellent choice for labeling assets because they are easily scanned with codeREADr using almost any smartphone, tablet or ‘player’ (e.g. the iPod Touch). 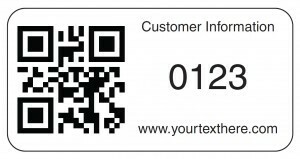 Recently we tested ‘variable data’ QR code labels provided by ImageTek, a custom label printer based in Vermont (USA). They print custom labels for QR code scanning at reasonable prices and have a quick turnaround time (see below). We recommend your QR codes be roughly 0.7” to 0.8″ square with a 0.1″ border. That allows almost any camera to quickly scan the QR code, even when off-axis and in dim or bright lighting. Smaller sizes are fine, as are other types of barcode formats, but you may sacrifice scanning speed unless you upgrade to our SD PRO scan engine which also uses the iOS or Android device’s built-in camera. For fast QR code scanning, we recommend having just the asset’s ID embedded in the QR code. So, for example, if the asset’s ID is ‘1234567890’ then that’s all you should have embedded in the barcode. It will then scan much faster than a barcode value with a lot more data, such as ‘1234567890 + Asset Name + Asset Location’. You can show the asset’s name and location to the person scanning in better way. You simply upload your asset database to codeREADr.com having ‘1234567890’ in column 1 and the asset name & location in column 2, along with any other info, URLs or images. This give you a lot more flexibility. Vinyl (LMV5000): Ideal for outdoor usage (<176⁰F) and moisture. Low gloss – best for scanning in sunlight and high ambient conditions. Polyester (LMP6000 – aka LPA7031): Durable solution, e.g. chemical and moisture resistance, or in temperatures ranging to 300⁰F. Medium gloss. Polypropylene (LMR4016): Adheres well on a large variety of substrates, good moisture resistance and for temperatures up to 200⁰F. High gloss. ImageTek will customize sizes, shapes, etc. to order. They have a minimum order of $150 USD which would get you roughly 1,500 custom 2.0” x 1.0” labels. Contact info: Trevor Billings (tbillings@imageteklabels.com).